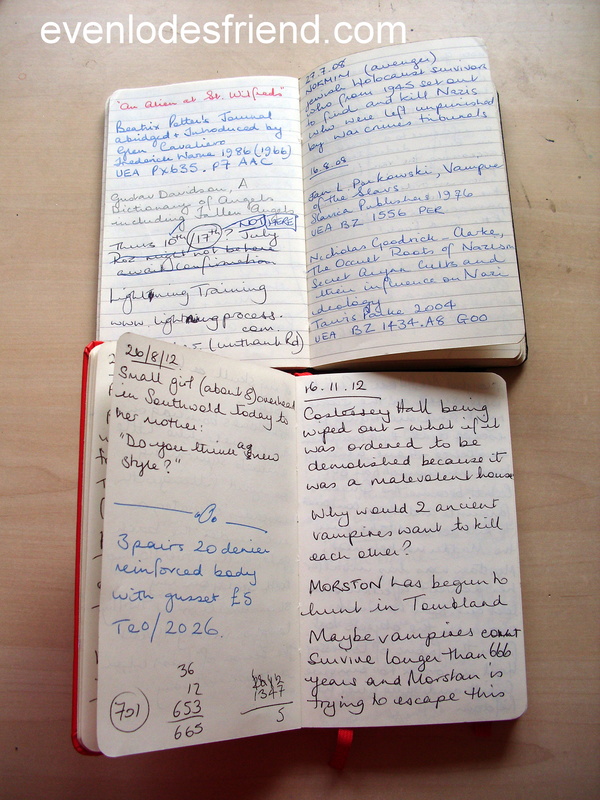 My spiral bound writers notebook – these pages show planning for a historical novel I am working on. Every craftsman needs a workbench. The notebook is to a writer what a workbench is to a carpenter. Every book about how to write will tell you that. The trouble is that there are as many ways to keep a writing notebook as there are carpenters’ workbenches. So I thought I would say a little bit about this most basic of skills. Your notebook travels with you continually, wherever you are. It is the hopper into which you throw all the useful scraps you collect on your journey through life. It is like a memory that you carry with you – one that won’t malfunction, unless you drop it in a pond or set fire to it, of course! This is where you scribble all your ideas, the clever sentences and metaphors you dream up, the quotes that inspire you, the snippets of conversation you overhear on the bus. In the old days, this was called a Commonplace Book, something like a scrapbook, but one in which you record more than events. It is a little like your journal, but more functional. I always like to think of mine as a record of the development of my mind. 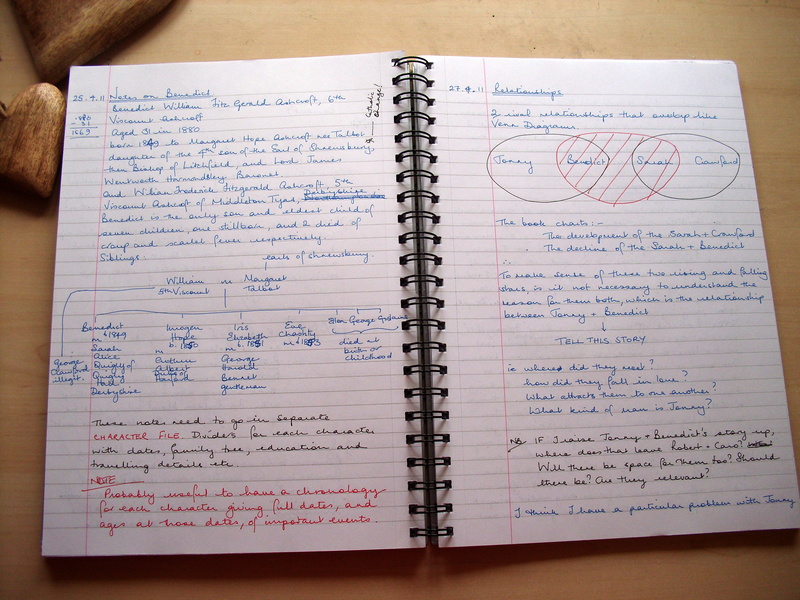 I use an A4 hardbacked spiral bound lined notebook by Pukka Pad, which I love. I can fold it over, stick things into it, draw diagrams, and because the cover is plain, I can decorate it however I like. However, A4 is a BIG size, and its not something I can just stick in my pocket and carry everywhere. As a result, I’ve evolved a second notebook. It is a tiny Moleskine, which I carry in my handbag. It is hardback too, so it withstands a great deal of getting knocked about, and chocolate stains. This is my scribble place, where I note things down on the move. My baby moleskine lives in my handbag. Snippets get stuck into these, as well as overheard conversations and quotes. Just to prove notebooks don’t have to be neat, or be devoted solely to your writing life – this one also has details of some tights my mum wanted me to buy her! This is a method of recording that I have developed over time. It may not work for you. You may need to keep everything in one place, in a single book, or you may need several different notebooks for different purposes. It depends on how you work, so it will be different for everyone. There is no one right way. But I suggest you start with a single notebook to make life easier. Potential character names – I came across someone called Theodicy Godbolt one day when I was researching 16th Century British History – you couldn’t make that one up! Whatever else takes your fancy – it’s your notebook! There is one absolute that every writer’s notebook should have at the back. A list of words and their meanings that you come across. Every writer should be expanding their vocabulary all the time. Come across a new word? Write it down somewhere you can refer to it, and then you will remember it! Sticking in pictures of actors who inspire you can be useful! These are just a few ideas to get you started. I’m going to talk a lot more about notebooking in future posts, not least because I am a notebooking fanatic, but you might like to grab yourself a pad and pen and start scribbling right now. And if this doesn’t inspire you, maybe you might like to read this, or this, which is one of the best books on writing I have ever read. 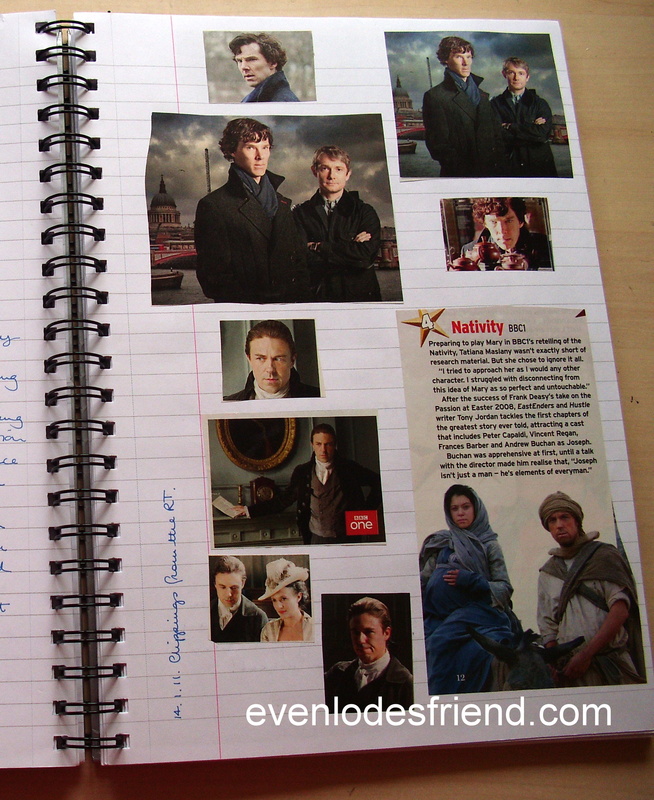 This entry was posted in Fanfiction, Learning the Craft, Notebook, Notebooking, Writing, Writing Exercises and tagged Moleskine, Notebook, Writer, Writers Resources on 22.04.13 by evenlode1967. You are very welcome. Having a great place to work, and the right tools to do your work, makes such a difference. Thanks for your reply! I am looking forward to reading more articles on your blog. Although I’m not a writer, I bought a Moleskine notebookwhile on a trip to Berlin last month. It’s great for capturing thoughts and ideas which might otherwise have just passed unrecorded through my mind; making lists which actually help organise my life gleaning information from all manner of sources for subsequent consumption. 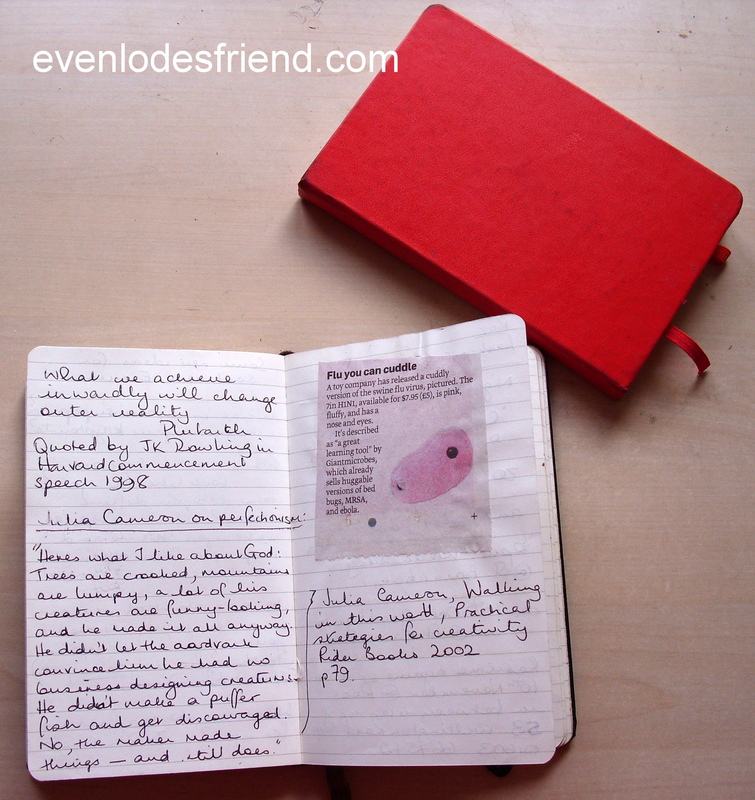 I think having an ideas Moleskine is an excellent idea for everybody, and I’m a huge fan. Keeping all those scrabbly thoughts in one place is bound to help organise life and make us more productive. Thanks for sharing! I enjoyed that, it’s interesting to see how people use their journals, notebooks, sketchbooks, writing books… happy creating!